The Hintergrat, know also as Cresta del Coston, it’s a famous and great ridge facing the North face of the Gran Zebrù and taking to the top of Ortles. The ascent in never technically demanding but it can’t be underestimated because of it’s exposition and the rock’s crumbliness. 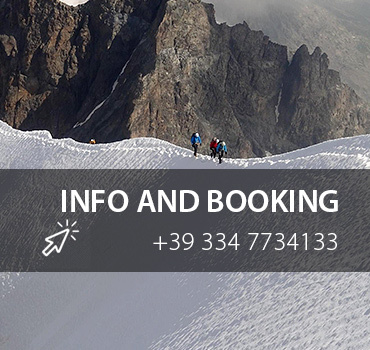 This ascent is suitable also for mountaineers who are beginners as long as they are in good shape and accompanied from a Mountain Guide. The ascent in never technically demanding but it can’t be underestimated because of it’s exposition and the rock’s crumbliness. This ascent is suitable also for mountaineers who are beginners as long as they are in good shape and accompanied from a Mountain Guide. From the Coston Hut (2661 m) the ridge’s shape appears as a succession of four peaks. The ascent develops at first on easy snow slopes on the left side of the ridge, since we reach the third peak, from here crossing a large pass we reach the foot of the Signalkopf (3725 m), the fourth peak. With short climbing steps up to the IV grade, frequent bolts in the rock, we climb over some rocky stairs, alternated with sharp ridge taking to the top in a short time. Day 1: We leave the car at the cable lift parking in Solda. We start with our equipment packed in our back pack, following the path n°2 for the Coston hut, walking flanki the Solda river for a while, climbing a rocky part to reach the moraine of the Solda glacier, near the cable lift middle station (if the ski lift it’s open we can use them in order to save energies and difference in height by foot). Following the path long a grassy slope we climb a small ridge (great view on the Gran Zebrù), we turn right in a glacier valley and we go up to the Coston hut (2661 m). Day 2: Left the hut at first lights of dawn, we walk on the moraine of the Solda glacier, flat part, flank the rocks descending from the Coston ridge. We climb over steep scree, where it’s necessary to be careful at the stones moved from the preceding ropes, to proceed on the ridge until a spike (II grade). Alternating parts on snow (also according with the season, temperatures and precipitations) and easy rocks we reach the Signialkopf. On it’s left side we descend diagonally with an abseil on a bolt fo about 20m to reach a ledge taking back to the ridge. An alternation of easy rocks (II and III grade), steep snow slopes (40°) and 2 key steps of IV (bolted) we reach the chimney and the ridge taking to the top. The descent normally is on the normal route, in direction of the Pajer hut. Even though is not difficult it must not be underestimate because there are several II grade steps and snow slopes up to 40°. Not included in the fee: hut’s half board, personal expenses, guide's expenses,eventually the cable lift ticket if necessary and all not specified in "included".